Head and neck is black in color. Shoulder, dorsal area and brest are dark blue. Bright blue shoulder patch can be seen in male. Flight fethers rump,main tail are blackish bround.Beak and feet are black. Iris is broun. Belly is brown Female is more browner. Her shoulder patch is pale. The plumage of imature bird is more beown with little blue. This bird is very shy. They prefer thick under groths. Sometimes it comes out. 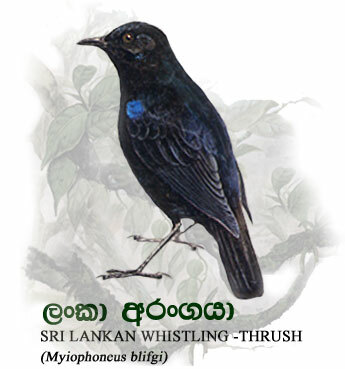 It can be seen hunting or singing on sticks or rocks beside streams. They prey on creatures like insects, geckos. strips are laied at a time. But most of the time only a one offspring is born. Haching is done by female, but the feeding is done by both male and female. They live hidden in place with water flowa at about 3000 frrt elevations. They can be seen in thick under grouths near flowing streams….They are recored in Haggala Horton place. Today they are restricted to the higher elevations of central hills. This bird is defficult to find due to it’s shyness. Rapid distruction of forest and drying off of water flows are the main threats.